DALI Ikon 1 Mk 2 review | What Hi-Fi? If you’re in the market for midrange, standmounted speakers, the DALI Ikon 1 Mk2s should be on your shortlist. With some neat design tricks and really good sound, these speakers are tremendous value for money. We’ll start with those neat tricks. The most eye-catching element on show is the ‘hybrid tweeter’ or – as normal people might say – two tweeters. There’s a ribbon one and a conventional dome one, and they work in tandem. The idea is that two is better than one – good enough for an awesome treble performance, in fact. It’s an idea DALI has taken from its high-end Euphoria and Helicon series. Further down is a 5in mid/bass driver made with wood fibre, which is stiffer than paper cones. The front baffle comprises two layers of MDF for extra vibration damping, and internal bracing helps to eliminate unwanted resonance. Hand-assembled at DALI HQ in Denmark, the Ikon 1 Mk2s are solid and well built, although we wouldn’t say ‘premium’. They’re somewhere between the luxurious Monitor Audio Silver 1s and the workman-like B&W 685 S2s. Vinyl-wrap finishes come in black or light walnut, or, for £599, you can have these speakers in high-gloss white. Onwards to sound, and these speakers want to be kept no less than 20cm from the wall, and pointed straight – no toeing in here. In those conditions, the performance is very impressive. DALI is known for clarity and detail, and the Ikon 1 Mk2s don’t disappoint. What you get is clean and crisp. Vocals and instruments are accompanied by plenty of subtle detail. The overall impression is one of remarkable insight. Then there’s the size of the sound. These aren’t massive speakers, but the sound is huge. We could do with a greater sense of height, but horizontally the stage is expansive. Timing is good. The DALIs comfortably keep up with any rhythmic shifts we can conjure up, even as we go from Hans Zimmer’s Mombasa to Man With A Movie Camera from The Cinematic Orchestra. The tonal balance also impresses us – no part of the frequency range gets undue emphasis. The bass stays on the good side of hefty: weight is evened out by a nice sense of articulation. The treble really shines, thanks to those two tweeters – there’s plenty of upper-range texture. We play Muse’s Endlessly and the opening percussion is rarely as forthcoming. Speaking of tweeters, we’re pleased to say the level of integration here is excellent. It never feels like there are three components on each speaker’s face, even when you listen for discrepancies. 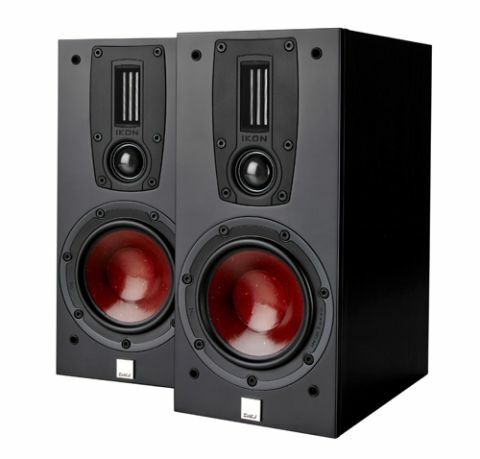 The only real problem here is the competition, and the B&W 685 S2s are stronger in some key areas. Their sound offers more subtlety and fine detail. The sense of scale is greater and more enveloping. They’re also lighter on their feet and have a meaner, better-timed punch. That said, the DALIs do better on integration. And we love their treble. And no doubt there’s appeal in smaller, better-made cabinets. The Ikon 1 Mk2s have a lot going for them. They may not be at the top of the class in every area, but there’s no doubting their strengths. If you have £500-£600 to spend on standmounters, we’d heartily recommend an audition.